BUILDER PERFORMANCE interior latex wall and ceiling paint is available in flat ready-mix colors and tint bases, providing precise color consistency for routine touch-up jobs. 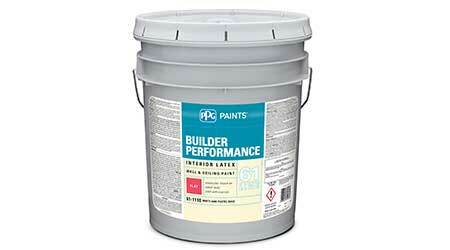 Builder Performance's low odor and application characteristics make it easy to apply by spraying, brushing or rolling. The product provides a uniform flat finish to help hide tape joints and surface imperfections, and its excellent hide and touch-up properties result in an even and quality finish. The curated Builder Performance color palette includes 10 top PPG Paints neutrals.